Make sure you hire the right personal trainer for you. Personal training by its very definition is a different experience for everyone. Are you a novice looking to learn how to exercise? Or are you training for a specific event? Maybe you’ve hit a plateau and need help moving past it. All of these factors, and more, need to be taken into account. Here are 7 of the most important things for you to look for to get you started. First and foremost, make sure they’re certified* and have sufficient training/education. 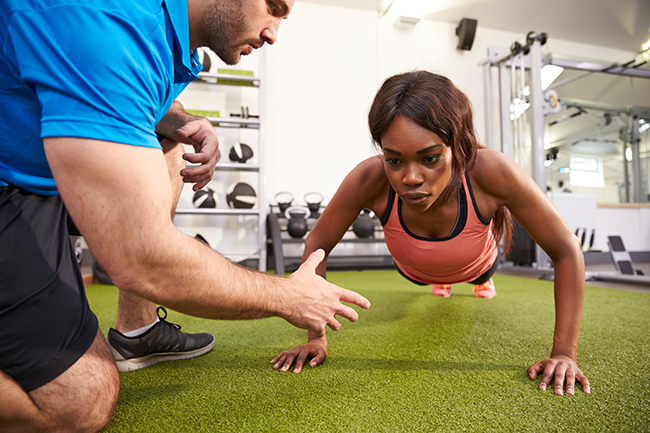 You may encounter personal trainers who have degrees that focus on physical education, exercise science, physiology, physical therapy, sports training, etc. Never be afraid to ask about a potenial trainer’s credentials. You want to make sure they didn’t just take a weekend online class that required nothing more than an open-book test. Especially if you’re training for a specific event or activity, you want to have some idea of why the person you are considering is going to be able to help you reach your goals. Just as important as a certification, if not more, is personal athletic experience. One training seminar or weekend does not an expert make. Some of the best personal trainers are regular gym goers, former college athletes, or former military that got into personal training because gym staff recognized their expertise and asked them to. You want someone who has gone through some form of training themselves and knows (to some extent) the challenges you will be facing. Bonus points if they have continued their education since getting certified. References are the gold standard in the fitness community. It’s one thing for the gym manager to recommend someone, but another to hear it from a former client. If you don’t know anyone personally, ask your potential trainer for at least two previous or current clients you can speak to. Don’t rely solely on a pamphlet or online testimonial. Ask the references what the trainer’s temperament is like, how dependable they are, and their training style. Are they more like a drill sergeant or a cheerleader? Do they give the same program to everyone or tailor to the client? How successful has the training been, and if not – why? Are they trying to sell you something besides training? Most gyms sell supplements – but that should be gym management’s job. Trainers should disclose any personal ties they have as a ‘representative’ for a company or brand, but some are not as upfront as others. If the first recommendation they make to you is about a pill or powder rather than regular exercise paired with healthy eating habits, stop there. Chances are your health isn’t as important to them as their bottom line. Do they have experience and confidence with your specific needs? We’ve alluded to this a little bit, but this is very important if you have a chronic illness, injury, or are training for a specific event. Have they experienced injuries themselves, or successfully worked with clients who have? Do they have training or education specific to your needs? Have they ever gone through a fitness or weight loss journey, or were they always fit and healthy? Examples: If you’re training for a marathon, a strength coach could add value, but not necessarily improve your time. If you want to keep your curves and lose weight, make sure they know how to incorporate strength training with cardiovascular exercise in a way that works for your level of fitness. Finally, the best trainer in the world won’t be able to do anything for you if you don’t have access to them. Whether it’s an issue of their rates being too high for you or that your schedules don’t match up, it’s important not to force the relationship. Hiring a personal trainer means that you both are taking on a commitment with time and money. It’s ok to shop around a bit and take your time! In the meantime, you could try group fitness classes or boot camp training. This is your time, money, sweat, and sometimes tears. Take it seriously. That being said, a good personal trainer is worth it – and SO ARE YOU. There are a number of other considerations you could make before choosing a trainer. Share your thoughts on this topic with us below. *Note: There may be times when a trainer previously had a legit certification that expired due to special circumstances, ie: having a baby or other medical event. The key here is that they’ve had actual training at some point. My son is a bit overweight and we’ve been wanting to get him back to a normal weight for some time. I liked that you had mentioned that it can be important to look at personal trainer’s experience to make sure they’re qualified to be training you. I’ll have to start looking around for an experienced personal trainer in the area to make sure we can get my son’s weight under control.